Наш друг и одноклубник VU2UR (Arasu) предлагает серию индийских дипломов, менеджером которых он является. Для членов нашего Независимого CW клуба возможны некоторые изменения в условиях выполнения этих дипломов в сторону упрощения. Всю дополнительную информацию можно получить непосредственно от Arasu arasuvu2ur@gmail.com. Он с удовольствием ответит каждому. Соискателям дипломов необходимо отправить свой лог с VU QSO дипломному менеджеру. Он проведет выборку необходимых контактов и определит какие условия выполнены. После этого Arasu сам свяжется с вами по электронной почте. Информация на английском языке и виды дипломов прилагаются ниже. Дипломы выдаются бесплатно ТОЛЬКО членам клуба CQCW!!! I have appreciated the awards from CQCW Club and want to reciprocate. You are welcome to the VU awards from VU2UR. They are free for the Members. Please send your COMPLETE VU LOG first. I will check and tell you the awards you qualify. If you are happy after receiving the award/s, you may send some mint stamps of your country worth an air mail letter. Duplication: Duplicate QSO's with the same call sign are NOT ACCEPTABLE for scoring. 2. For confirmed QSOs with a Coastal Island group(only one expedition QSO is counted per island), on any date, counts at 15 points each. Sagar Island - AS-153 (4 expeditions) West Bengal State Gr. Sacrifice Rock - AS-161 (1 Expedition) Kerala State Gr. Elephanta Is - AS-169 (3 Expeditions) Maharashtra State gr. Arnala Is - AS-169 (1 Expedition) Maharashtra State gr. Pamban Is - AS-173 (1 Expedition) Tamil Nadu State Gr. Nachugunta Is - AS-199 (1 Expedition) Andhra Pradesh State South Gr. Grandi Is - AS-177 (1 Expedition) Goa State Gr. 7. Any QSO with the Indian Antarctic Expedition Station counts for 20 points. 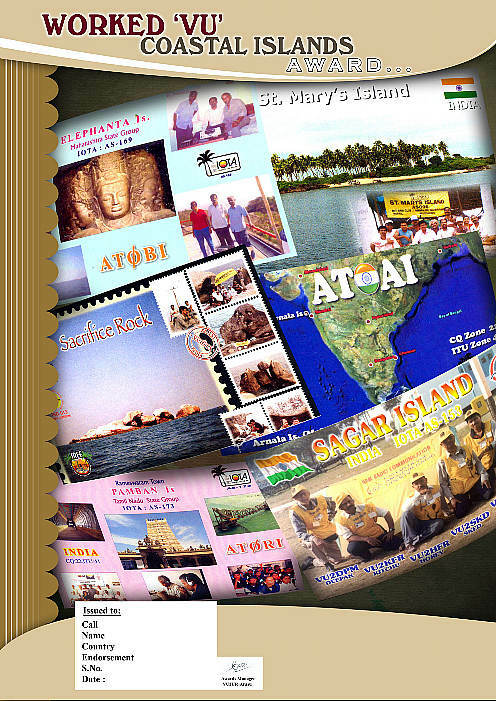 IOTA AN-010,016; WAP-IND-01-Dakshin Gangothri; IND-02-Indian Bay Camp;IND-03-Maithri. BASIC: If you have confirmed QSOs with any THREE groups. For example:(i) Andaman (iii)ONE of the Coastal Is Groups, then, the number of points required for the or Nicobar Is; (ii)Lackshadweep or Minicoy Is, “Basic Award” is a minimum of "50" points. Minimum 3 QSL cards needed. FIRST: If you have confirmed QSOs with each of Andaman, Nicobar, Lakshadweep and Minicoy Is Groups, THREE of the Coastal Island groups,and two Indian Antarctic QSOs, activated till the date of your application,with over 120 points,you get "FIRST Class Award". 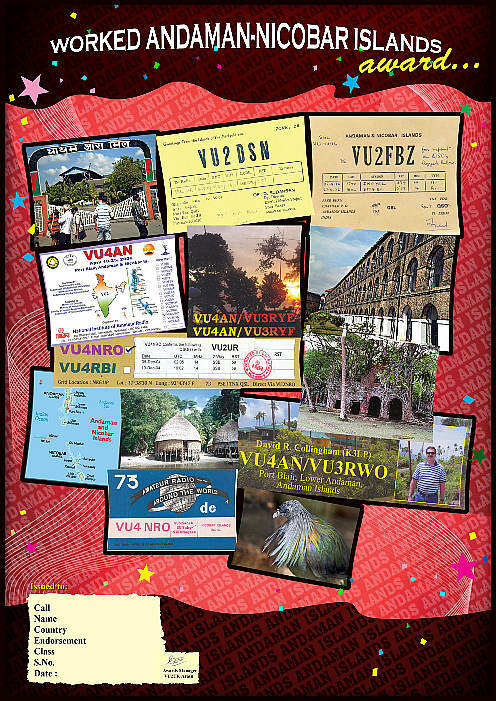 Minimum of 9 QSL cards needed. EXCELLENCE: If you have confirmed QSOs with EACH of Andaman, Nicobar, Lakshadweep and Minicoy Is Groups, FOUR of the Coastal Island groups,and two Indian Antarctic QSOs, activated till the date of your application, you get "EXCELLENCE Class Award". Requirements, for this class is a minimum of 150 points. 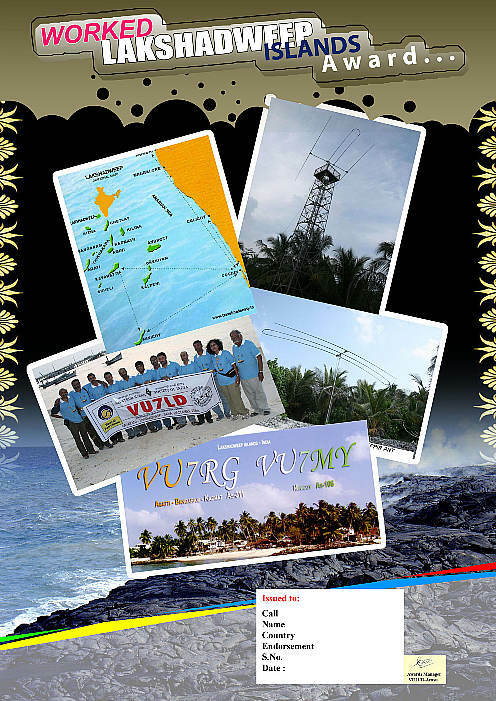 Minimum of 10 QSL cards are needed. AWARD MAILING: The award would be of "A4" size (210x297 mm), in multi-colour. From the experiences of many amateurs, it is seen that Postal Transit Losses and folding/mutilations are very common/frequent. To avoid this sort of a loss or mutilation, this award is issued in the ELECTRONIC FORM and sent to your E-mail Id, ready to be downloaded at your end, in “pdf” format. Award Fee is 7 latest IRCs or Bank's Demand Draft for 7 US$ 0r 5 Euros to be sent to VU2UR's postal address(by Registered post only, as the pilfereage in postal transit is TOO much).Green Stamps are NOT to be sent under any circumstance, by mail. 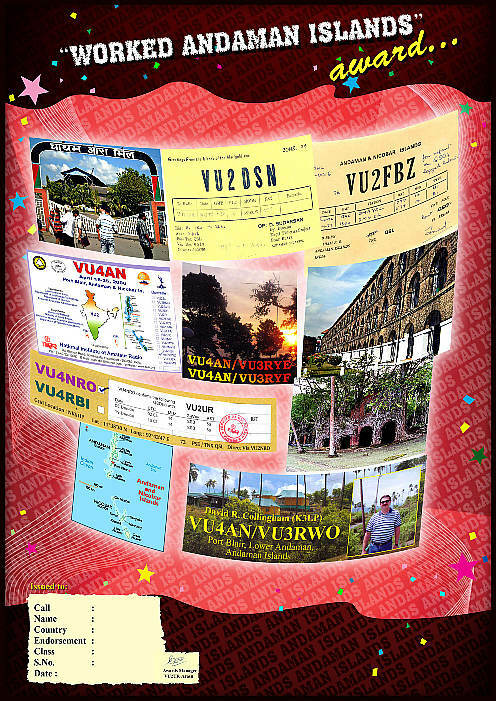 The first series of Six Awards contained: SAARC Award, Himalaya-Hind Sagar Railway Award, VU-10 Million PIN points Award; World Heritage-India Award; ANNILAMICI Award and Worked VUFF Award. The interest shown by the world of amateurs, is very encouraging. The following seven awards in Electronic form, contain five simpler awards for working various VU Islands, like VU4, VU7 and Coastal islands. 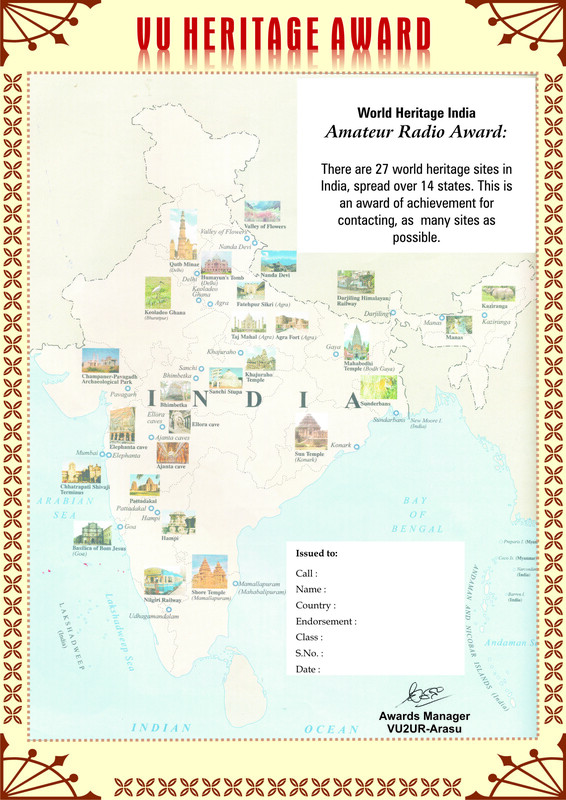 The other two awards are for working VU Amateur Radio Contesters and the City of Bengaluru. No QSLs required. No date limit.All bands all modes including WARC bands OK. Endorsement for single mode, single band can be given. Only Electronic Award. in "pdf or jpeg" format will be mailed to your E-mail Id. Please do not send any Green Stamps or Euros in snail mail, which are always stolen in transit. 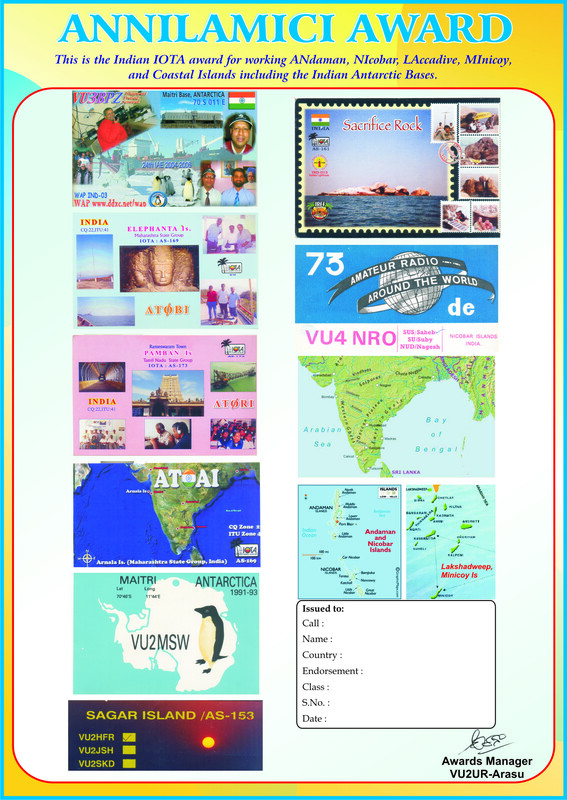 For First Class Award, you need 8 different Andaman and 1 Nicobar QSOs and for Excellence Class, you need 12 different Andaman and 2 Nicobar QSOs. Requirements: Work minimum of 3 different Lakshadweep(Laccadive) Stations Fee ONLY 2 IRC. Submit GCR list. Requirements: Work minimum of 3 different Lakshadweep(Laccadive) Stations and 1 Minicoy Station. . Requirements: Work any 3 different stations from the above list, in any one or more Contests, (giving the name of the contest), or non-contest QSOs, too are valid. No QSLs required. No date limit. All bands all modes OK. The city of BENGALURU( a k a BANGALORE ) the capital city of the State of Karnataka is known as the ELECTRONIC CITY or GARDEN CITY or SILICON CITY or IT CITY of India. The city has over 1500 amateur licence holders QRV in VHF/UHF/Satellite / CW/SSB/and Digital modes. Requirements: Work any 2 different stations from this city.